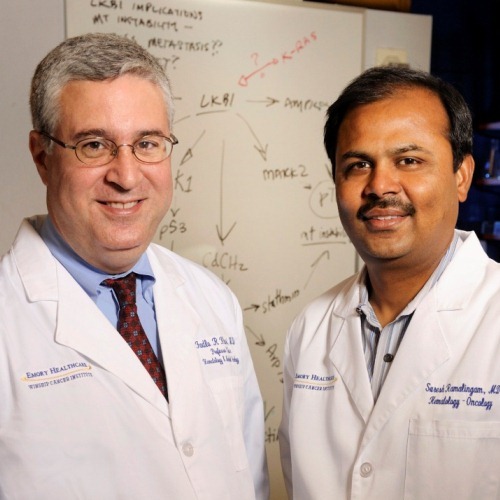 Fadlo R. Khuri, MD and Suresh S. Ramalingam, MD, top lung cancer clinicians and researchers at Winship Cancer Institute, have co-authored an editorial in the April issue of the journal Cancer that takes a bold step against major tobacco companies. Khuri, editor-in-chief of Cancer and Ramalingam, a section editor, declare that the journal will no longer consider any scientific work or correspondence funded directly or indirectly from tobacco companies or their subsidiaries for publication. With five million people expected to die of tobacco-related diseases worldwide, the authors say this should "give everyone reason to pause and reflect on measures that each of us can undertake to promote research, educate the public and more importantly, prevent the spread of misinformation propagated by the tobacco companies." Read the complete Cancer editorial.